Over one hour of crazy new phrases that Bunyamin is playing for Raquy to try and copy! This is a precious window into Bünyamin and Raquy's Training Session. Bünyamin plays a phrase and Raquy answers back the same thing. Try along with Raquy to copy Bünyamin's phrases! Good luck! They are using the techniques taught in the Darbuka Method. Bünyamin Olguncan was born in Samsun Bafra, Turkey in 1972. He began playing darbuka at age 7. He studied music at Samsun Belediye Conservatory. He moved to Istanbul in 1987 and began playing with singers and recording on cds. He also became exposed to the new Turkish Split Hand technique and started practicing with master musicians. He was the leader of the world renowned Harem Rhythm Group and made two albums with them – Harem I and Harem II. He released his solo album “Istanbul Drummers” in 2007. He played with Turkish pop start Tarkan for 12 years and performed all over the world with him. In 2009 his student Raquy Danziger released a Darbuka Instructional Book/DVD featuring Bünyamin and his teachings. In 2013 Raquy has released two albums “Bal Dudak” and "Monkey Mind" featuring her teacher Bünyamin. 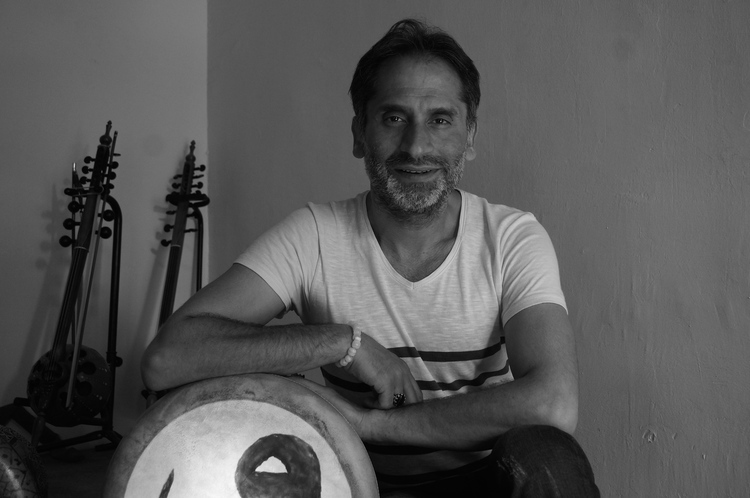 Bünyamin has become a shining example of the new Turkish drumming style and is known and appreciated world wide for his elegant hands and beautiful sounds. Drummers come to Istanbul from all over the world to learn from him. For Advanced Players - play copycat w Bünyamin!